DeJarnette Designs: FOR SALE! 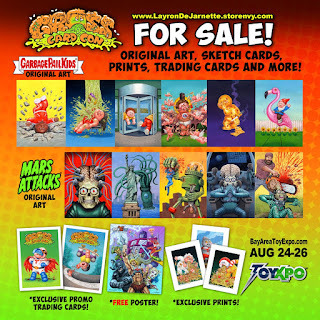 Final ART: GPK, Mars Attacks & MORE! Hey Blogger family! I'll be a guest at ToyXpo in the Santa Clara Silicon Valley Central Convention Center on August 24-26! If you’re in the area, please stop by. I’ll be selling original art, exclusive prints, exclusive trading cards and giving away free posters and trading cards with purchases.